Trained & Certified Staff, Book Online Now! With over 30 years of Service in Plumbing & Heating Industry, we have the experience and reputation necessary to assist with your plumbing and heating needs. T-Mont Plumbing’s mission is simple, make our customers “feel at home again” . This simple company philosophy was born 20 years ago,and has been nurtured ever since. 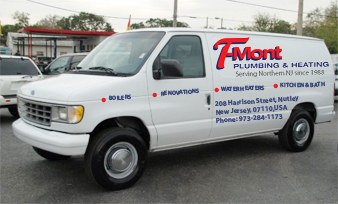 No plumbing company in NJ goes the lengths we do to ensure all your service needs are met. Our experienced servicemen not only diagnose the issue, but lend additional useful plumbing tips to our clients to aid in preventitive measures. Our range of services extend to all residential needs as well as emergency on the spot calls. Our plumbers are ready to assist when an issue arises. If your tired of getting the run around from your current NJ plumber, contact us today and let’s discuss your concerns. Our no obligation , free “Honest” estimates can aid in finding the right solutions for the most simplest problems.Our goal is your goal ” feel at home again”. T- Mont Plumbing can get you there.